The Hants & Dorset bus company first came into being in March 1916 and was known as Bournemouth & District Motor Services. It wasn’t until July 1920 that the name was changed to Hants & Dorset Motor Services Limited as the services had expanded from beyond the Bournemouth area. In 1942 the company became part of the Tilling group. In 1948 following the nationalisation of the railways and the sale of the Tilling companies to the British Transport Commission, Hants & Dorset was now state owned. Twenty years later, following the 1968 Transport Act, the National Bus Company (NBC) was formed on 1st January 1969 of which Hants & Dorset became a part. Also on that date Wilts & Dorset, based in nearby Salisbury, became ‘Hants & Dorset trading as Wilts & Dorset’. 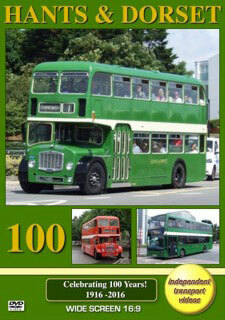 Up to this date the Hants & Dorset buses ran in Tilling green livery with their Wilts & Dorset cousins in Tilling red. In 1972 it was decided that the Wilts & Dorset name would be removed and all buses would carry the Hants & Dorset fleet name, but run in corporate red livery using NBC Poppy Red paint. In 1983 NBC policy dictated that Hants & Dorset be broken up into smaller units. From April 1983 the fleet names Wilts & Dorset, Hampshire Bus, Provincial and Shamrock & Rambler would be used with the Hants & Dorset name becoming redundant. The current operator in the former ‘Hants & Dorset’ territory is the Go-Ahead Group (Go South Coast). The Group bought Wilts & Dorset in 2003, with Southern Vectis and Solent Blue Line following in 2005. The buses now run under the brand names of ‘more’ (Bournemouth and Poole), Bluestar (Southampton) and Salisbury Reds (Salisbury). The year 2016 marks the centenary of the formation of the original Company. It was decided by Go South Coast that an event should take place to mark this historic milestone which duly took place on Sunday 10th July at Poole Quay in Poole which is now the headquarters of ‘more’. A number of preserved buses and a current member from the Go-Ahead London fleet in the shape of New Routemaster LT60 in ‘London General’ livery were invited to either be on display along the Quay or to operate four special services. There was route 1 to Bournemouth, a long established Hants & Dorset service, route 32 to Sandbanks Ferry, route 94, a railway station shuttle bus and route X100 from the Quay to Lytchett School. Buses were also parked at Seldown Coach Park on layover, which is adjacent to Poole bus station. Our filming began very early on the Quay. Unfortunately the weather was appalling! Strong winds and driving rain made filming very difficult! However our cameras managed to record the arrivals and departures. Filming also took place at Seldown Coach Park, and on the concourse at the bus station. Here we filmed the current operations of ‘morebus’ intermingled with the preserved and visiting vehicles making fascinating video for you to enjoy! Our cameras also took four rides. Firstly on board Bristol VRT, 3325 (JJT 437N) superbly restored in Wilts & Dorset deregulation livery. This VR was new to Hants & Dorset in 1975. Our second ride is on 563 (SDL 258) a former Southern Vectis Bristol LD, identical to the type used by Hants & Dorset in the 1950s and 1960s. Our third is on Hants & Dorset 1557 (LLJ 443F) a 1967 semi-automatic Bristol FLF. And finally we travel on a 1950 former Bournemouth Corporation Leyland PD2/3, 247 (KEL 133) travelling from the bus station to the Quay ending a most enjoyable day. Finally as a bonus on this programme we were privileged to join in on a photo shoot with ‘Bus & Coach Preservation’ magazine of the newly restored and reliveried Hants & Dorset semi-automatic Bristol Lodekka FLF6B, 1254 (KRU 224F). We took it through its paces on a ride around the Dorset lanes and into Ringwood savouring the unusual sounds of this very unique vehicle. Enjoy!